PDP accuses President Buhari and APC of violating Peace Accord – Royal Times of Nigeria. The National Chairman of the Peoples Democratic Party (PDP), Prince Uche Secondus, has said the President Muhammadu Buhari and the All Progressive Congress (APC) have declared war on the main opposition party leaders across the country, thus violating the peace accord signed by the political parties. 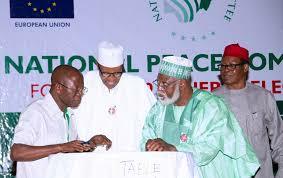 The party boss, in a statement in Abuja on Friday, declared the accord dead as according to him, all the terms of the agreement for peace have been broken by the ruling APC who he noted has deployed military and the Police operatives to arrest and detain PDP leaders across the country. Secondus revealed that reports reaching him from Kwara, Akwa Ibom, Rivers, Kano Kaduna and other states showed that PDP leaders were being harassed with arrest and detention by security operatives on flimsy reasons. It would be recalled that the Kwara State Police Command on Friday confirmed the arrest of senator representing Kwara South, Dr Rafiu Ibrahim, and eight others over the murder of one person during an attack on members of the APC at a rally in Ojoku town, Oyun local government area of Kwara state. The PDP boss advised that General Abdulsalmi Abubakar-led National Peace Committee to take copious notice of all the happenings and note that APC and President Buhari were not disposed to any peace accord.